@U2 is partnering again with the Rock & Roll Hall of Fame for a weekend of U2 fun. Couldn't get tickets to our #U240Dublin event? Or maybe it's just too far away? Well, as promised, we're putting on a second event that will be closer to home for many of you. 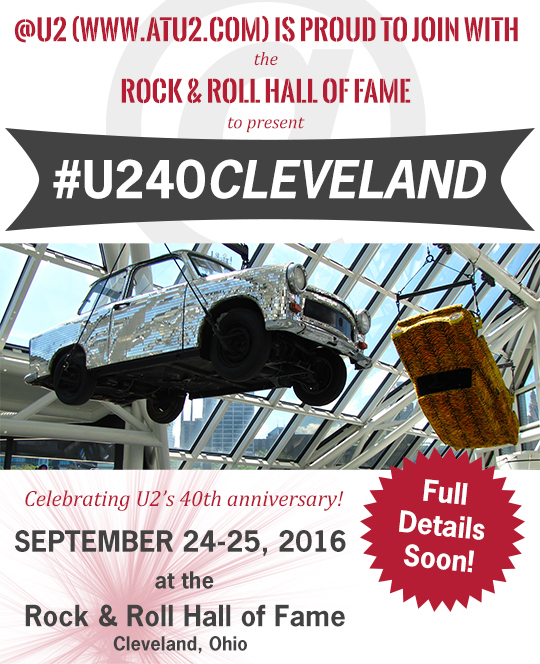 @U2 is proud to partner with the Rock & Roll Hall of Fame for #U240Cleveland, a two-day celebration of U2's 40th anniversary that will take place on September 24-25, 2016. We're working with the Rock Hall right now to schedule two full days of fun on Saturday and Sunday, but we don't have a ton of details to share at the moment. We're expecting the event to run from 10:00 am to 5:30 pm on both days, and there may be a Saturday evening element, too. The Rock Hall will be selling tickets, and we're working with them now to determine the best price. We'll share ticket information as soon as possible. There are a number of quality hotels within walking distance of the Rock Hall. Our crew has found good rates at the DoubleTree (Cleveland Downtown-Lakeside), especially if you join (or are already a member of) the Hilton HHonors program. The DoubleTree also has a free shuttle that covers the downtown area. There's a Westin, Marriott and a Hilton nearby, along with several other hotels. If you're planning to join us, we recommend booking soon. To be frank, we normally wouldn't announce an @U2 event with so few details to share. We've debated for the past several days, When should we announce this? Do we have enough information yet? But with the #U240 weekend just two months away, we wanted to tell you as much as we can now so you can start making travel plans. It'll be a really fun event. Many of our North American staffers will be there for the full weekend, and we hope to see many of our readers, too.